Continuing our Talents guest mix series we have another exciting new mix today. This one is coming from a talented vinyl DJ from a little village called Asch, between Utrecht & Den Bosch. Frank van Hattem is also better known as Dirty Wakka and he has a big love for drum and bass. 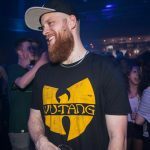 He’s been mixing since 2015 and his name has been on a lot of line-ups already, ranging from the local Mass Productions event in Utrecht to the Let it Roll festival in 2017. Dirty Wakka is doing quite well. For this series he has been carefully selecting tunes, covering a wide spectrum of drum and bass music. Just how we like it! So kick back, pump up the volume on your sound system and enjoy the ride!